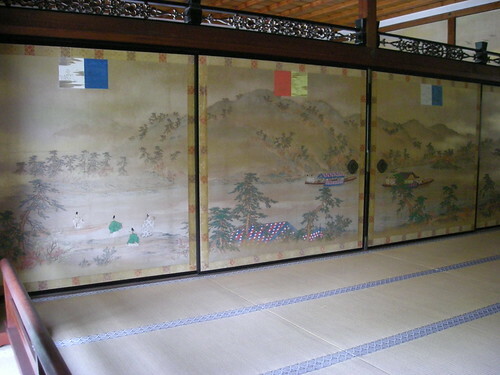 As you look into each room in Shinden, you’ll notice the different paintings that depict one of the four seasons, and you’ll notice that the last room is more embellished than the others. 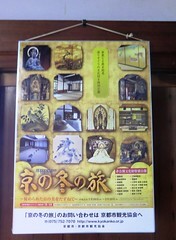 The last room, the “Upper Room” （上の間 jō no ma), was the abbot’s chamber and is splendidly decorated from floor to ceiling. What you may not notice is that the floor of the room is actually raised up considerably from the level of the other rooms. 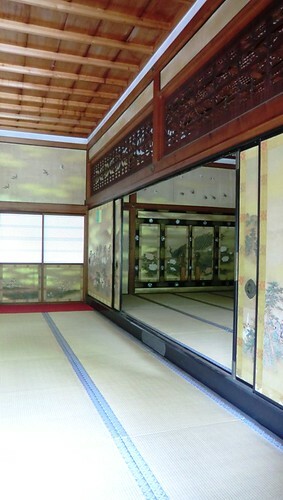 Recently, Shinden was open for the ikebana event and the sliding doors were opened, revealing the step up into the last room more than usual. While you might not be able to observe the difference as easily as you can in this picture, it is also possible to see the difference in height from outside of the rooms. Usually visitors are too busy appreciating the paintings and other embellishments in the room to notice it initially, but the raised floor is one more detail that makes the Upper Room a more formal space than the others. 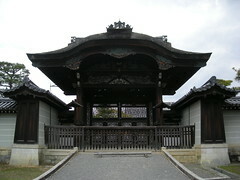 At Ninna-ji, latticed shutters like those on the left can be seen on three buildings: Shinden in the palace grounds, Mie-do (the Founder’s Hall), and the main hall of the temple, Kon-do. These shutters are called “hajitomi” (半蔀 “half lattice”) or “shitomido” (蔀戸 “latticed shutters”) in Japanese. When the weather is nice, the hinged upper half of the lattice is lifted up and held in place with long metal hooks that descend from the ceiling. During inclement or cold weather, the shutters remain closed and help to keep out the elements. The lower half of the shutters can also be removed, making it possible to open up an entire wall if one so desired. Hajitomi originated in the Heian Period (794-1185 ) and were an important architectural element of palaces and aristocratic residences. They are, therefore, a relatively uncommon sight at a temple. To the left, you can see the shutters on Shinden that face the South Garden. Shinden was the main residence of the retired emperor and the inclusion of hinged shutters adds to the aristocratic-feel of the architecture. 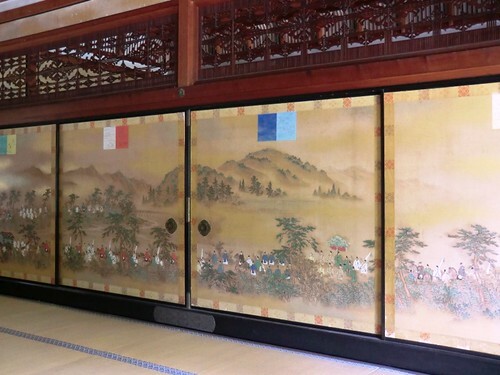 That these shutters can also be found on two buildings intended for religious purposes, Mie-do and Kon-do, is more unusual. 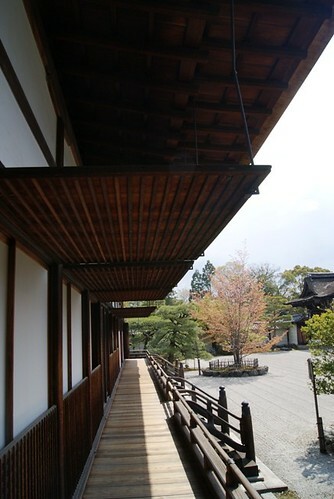 The reason for their distinctively aristocratic architectural style is that both Kon-do and Mie-do were given to Ninna-ji by the Kyoto Imperial Palace. These buildings were originally built at the Imperial Palace, but in 17th century both were taken apart, carried to Ninna-ji, and reconstructed on the temple grounds. The hajitomi on these buildings serve as a reminder of the buildings’ original purposes and of the close ties Ninna-ji long maintained with the Imperial Palace.